NASFAA’s Campus-Based Aid Allocation Task Force was convened by the NASFAA Board of Directors to examine the formula by which congressional appropriations for the Federal Supplemental Educational Opportunity Grant (FSEOG), Federal Work-Study (FWS), and Perkins Loan programs are distributed to schools, and, in consultation with appropriate groups, develop proposals for changes to the allocation formula. 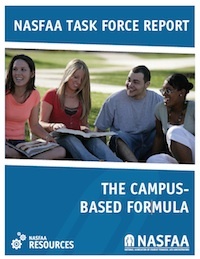 This work is intended to inform the ongoing Higher Education Act reauthorization. The task force comprised a geographically diverse group of 13 NASFAA members from all types of postsecondary institutions, with a particular emphasis on the inclusion of members representing schools with the full range of campus-based aid allocations. The group conducted its work between October 2013 and June 2014, and its recommendations were accepted and approved by the NASFAA Board of Directors in June 2014. Increase the percent of self-help assumed in the undergraduate institutional need calculation of the Federal Work-Study and Perkins Loan formulas to 35% self-help, including a phase-in provision whereby no institution has a decrease or increase of more than 10 percent per year.